We have been working with municipalities of all sizes across the world to learn what makes a smart community. Through our many years of research we have noticed that the most effective organizations have a clear vision and articulation of their prioritized goals — and involve their entire community, internal colleagues, as well as external stakeholders, using common tools and conversations. Last year, the City of Los Angeles launched their GeoHub – a configuration of ArcGIS that allows the public to search, explore and download open data. Using ArcGIS Open Data, story maps, and configurable apps, Los Angeles pioneered this kind of community engagement, highlighting the city’s goals and progress towards clean streets and other projects. We have seen governments large and small modernize their public engagement through open data and public information. Los Angeles’ experiences teaches us that citizens and residents need more than just open data. They want to be empowered to make meaningful decisions which improve their own neighborhoods. And government wants their community to buy in and engage with official policies. 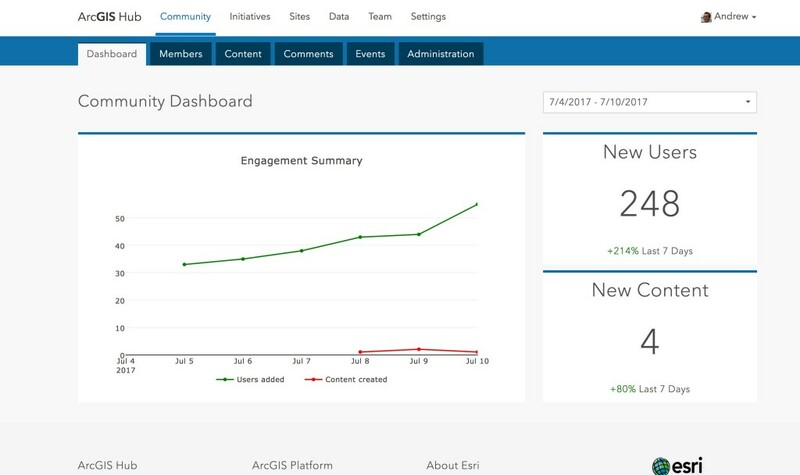 ArcGIS Hub is a new product from Esri that supports effective community engagement on important Initiatives. 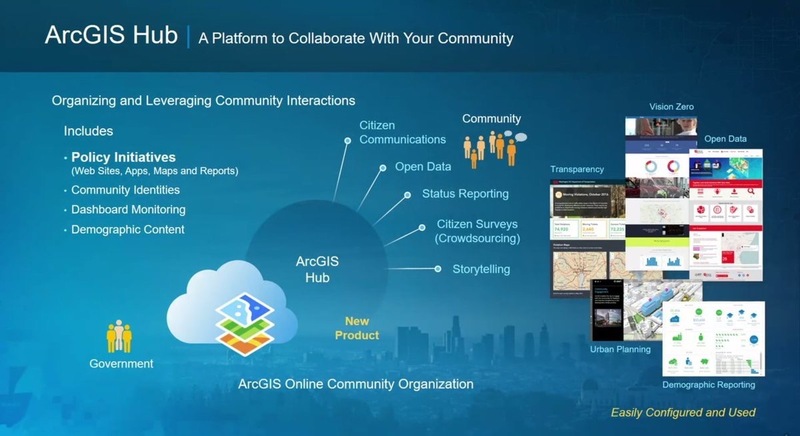 ArcGIS Hub provides every resident with a community identity to become a full, named user of ArcGIS with the ability to gather data with surveys, perform spatial and statistical analyses, and create StoryMaps and insights to share with their community and back to the government. Initiatives are policy-driven goals that improve organizations and community outcomes. For example, Vision Zero is an initiative to prevent traffic-related deaths and Reduce Homelessness supports programs to increase access to affordable housing and social services for homeless people. Initiatives are templates which can be adopted, configured and extended by organizations. These are conveniently organized in the ArcGIS Hub Initiative Manager and coordinate cross-departmental work. Initiatives require data indicators: layers, tables, or values that are used to monitor and measure performance towards a goal. Because many organizations use their own data models, ArcGIS Hub provides tools to dynamically transform your data to common, standardized data models that can be reused in shareable app templates analyses. 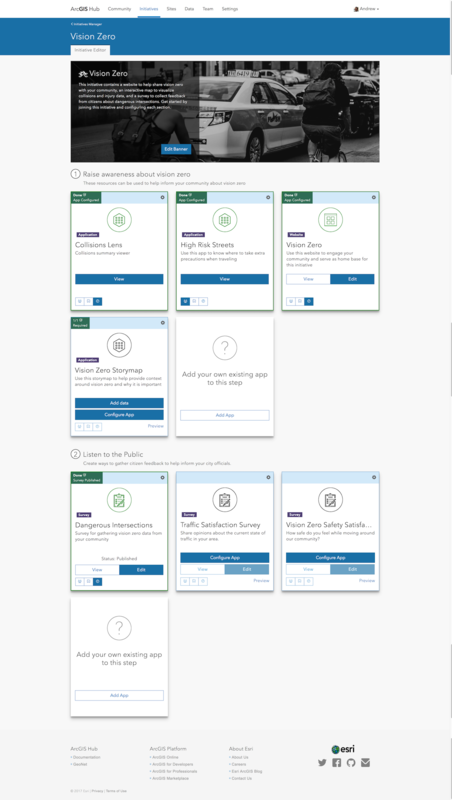 Esri has created the initial Initiatives in collaboration with early adopters – and Hub organizations can create their own custom Initiatives which will grow the network of Initiative templates. Over time, government can share best practices and shared Initiatives with one another, learning and evolving for better outcomes. Every resident of a hub municipality become a full, named user of ArcGIS with the ability to use platform capabilities to gather data, analyze information and publish stories and pages to advocate for positive change. Community members of a hub organization can sign in with their social media accounts like Facebook and Google. This creates an account managed in a community organization where users can contribute data, apps, create groups, generate infographic reports from Business Analyst and use any of the online analytics or premium products like ArcGIS Maps for Office to work with data directly in Excel and Powerpoint. 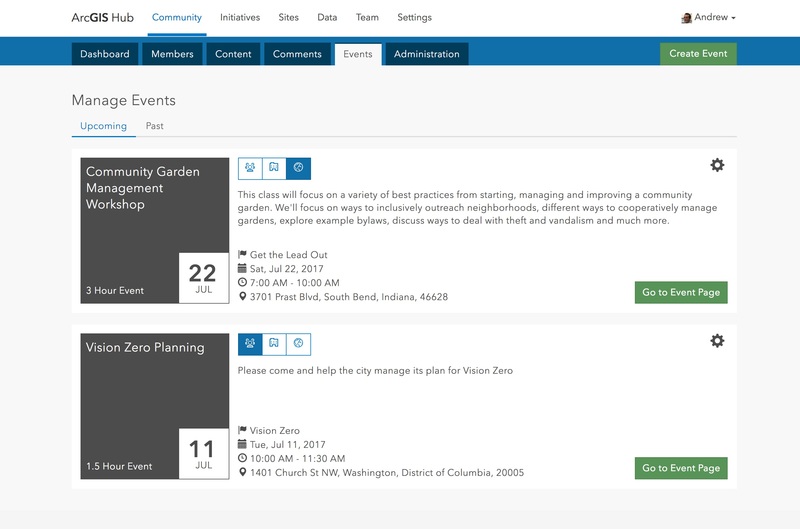 Government can coordinate with their community in the ArcGIS Hub Community Manager. They can schedule events, connect with residents who care about particular issues, or explore publicly shared content from the community. The opportunity is to leverage the community as an intelligent and capable augmentation to the government workforce. ArcGIS Hub is working with several early adopter governments to evaluate and improve the product capabilities and hub framework methodology. We will be inviting more early adopters throughout the summer and expect ArcGIS Hub to be generally available in October. 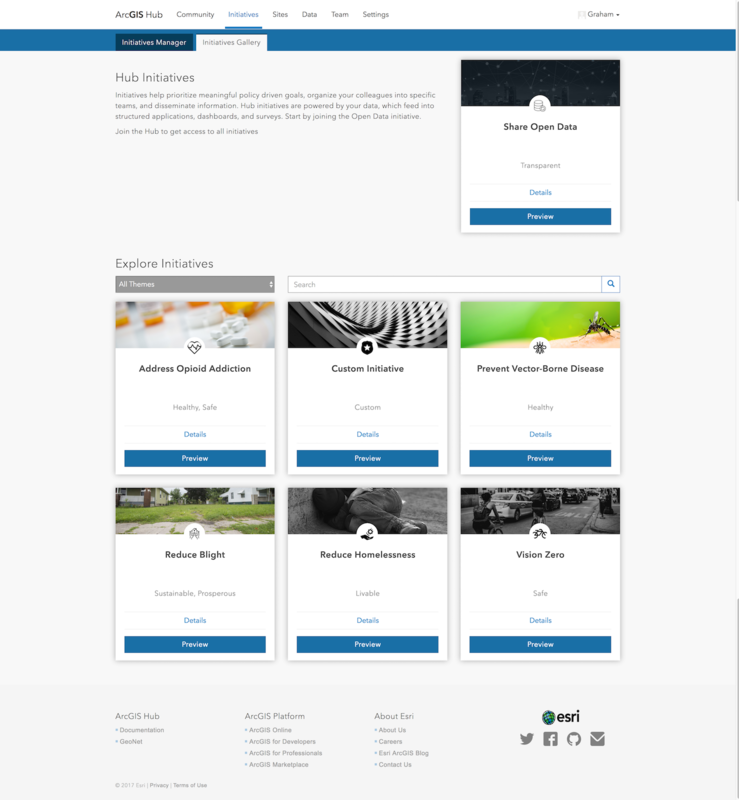 Please connect with us to learn more about ArcGIS Hub, find out how to become an early adopter and start your path to becoming a smarter, more engaged community today.